Invisalign is a breakthrough technology that lets you have the smile you’ve always wanted, without the hassle of braces. By using a series of clear, removable aligners, Invisalign straightens your teeth with results you’ll notice sooner than you think. An Invisalign course of treatment can take anywhere from 2 – 24 months. The course of treatment involves changing aligners approximately every two weeks, with each aligner progressively moving your teeth into a more aesthetically pleasing position, until you have a more beautiful smile. The total number of clear aligners is specific to your smile and determined by our dentists. If you’re ready for a smile that transforms your appearance, Invisalign is your answer. It is simply a great way to transform your smile without interference in your day-to-day life or busy schedule. Customized: Your doctor will take precise impressions and customize your aligners specifically for your teeth. Effective: Even before your Invisalign treatment is finished, your teeth alignment will improve and you will begin to enjoy the benefits of your beautiful new smile. Comfort: With Invisalign, the edges are smooth so they won’t irritate your cheeks or gums. 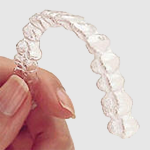 Clarity: Invisalign is invisible, so no one will even know that you are straitening your teeth. Removability: You can remove your Invisalign aligners to eat, drink, brush and floss or for special aligners. Not only is Invisalign versatile, helping to correct a broad range of dental and orthodontic issues, but it really works. There are over half a million smiles to back that up, however a confident smile isn’t the only benefit of correcting your dental issues with custom made Invisalign aligners, your health can be positively impacted as well. Invisalign can correct: Overly crowded teeth, widely spaced teeth, crossbite, overbite and underbites. Will it fit my life? With Invisalign, all you need to adjust to is your new, beautiful smile!